So, last week I told you that I would be back here again this week, reporting on 4 more events. Well, 2 of those events were cancelled due to weather, so I only have 2 to report on for the time being. Side note: this has been the craziest winter! We have had so many snow days here in Greene County, I have already had 3 2014 events that were either cancelled or rescheduled due to weather and a 4th that I had to tackle in the middle of a snowstorm. Not to mention, the creativity I have had to implement in order to get my work done, due to the fact that my children have been out of school more than they have been in it this year! These fabulous Creation Health jackets (which I am thankful to have one of my own) were given to the physicians who are on staff @ both Takoma and Laughlin for Christmas. 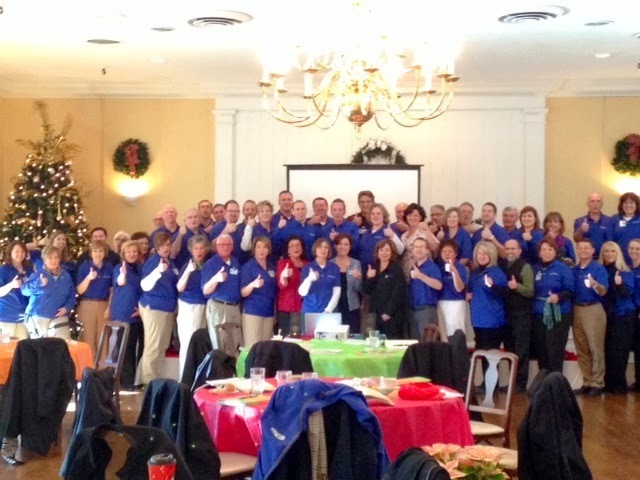 This past week, I had the privilege to speak to a group of these physicians @ Laughlin, giving them an overview of the CH program and why/how it is being implemented here in Greene County, at both hospitals and out in the community, so that they can proudly wear their jackets to help promote the program! 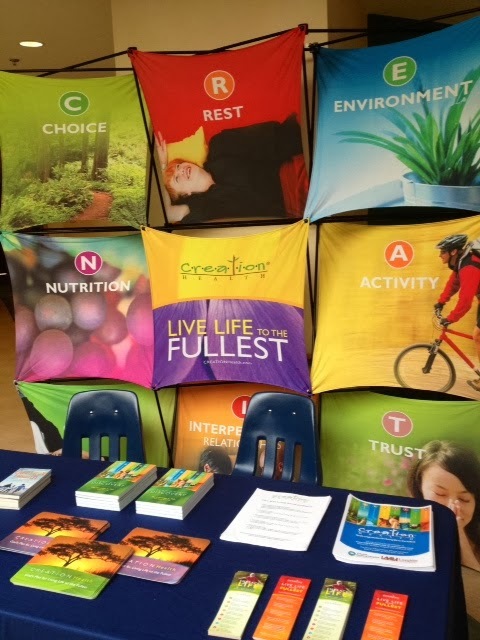 On Saturday, with the help of Bob, the wellness director from Takoma, and Janie, one of my Takoma coaches, we set-up a booth at the annual Appraisal Fair @ GHS, where we passed out CH books and other promo materials, while people shopped and had their antiques appraised. 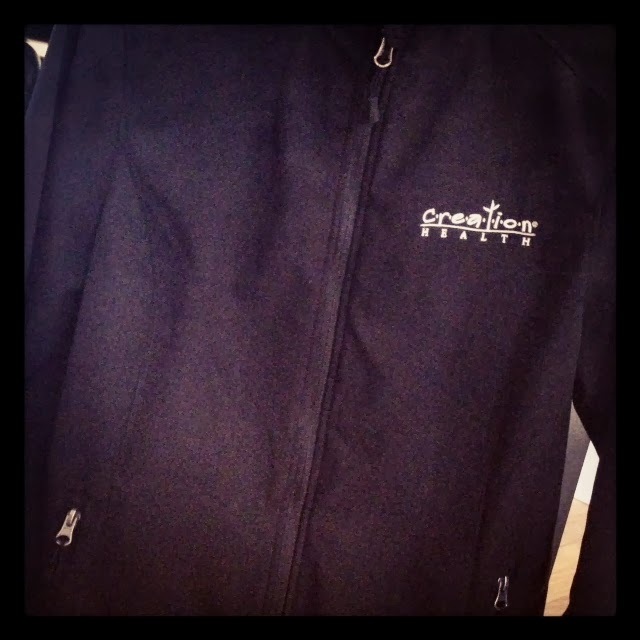 All in all, it was another successful week in the life of Creation Health - Green County! Let us know how we can be apart of your next event! 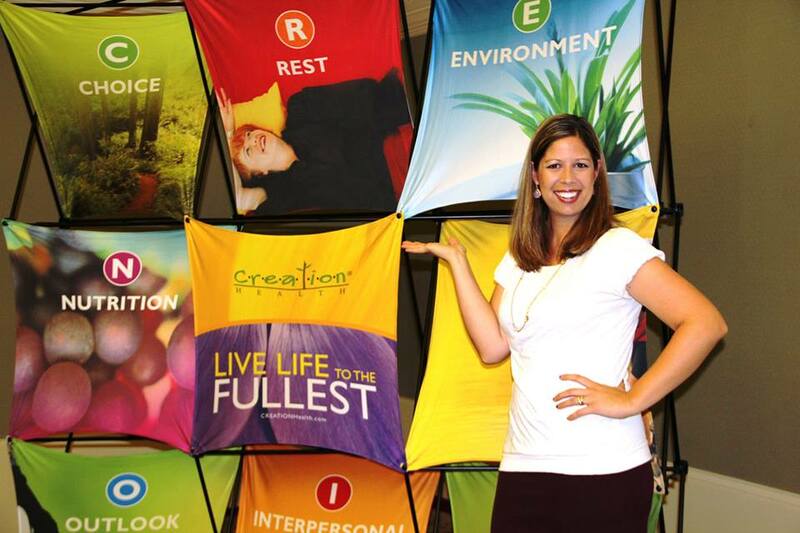 About the Author: Erin Franklin is the Creation Health Coordinator for Greene County and the Founder/Director at Worthy of the Prize Sports Ministries. Erin has a BBA in Marketing and Management from TCU and a Masters of Christian Education in Church Recreation from Southwestern Seminary. She is a published, award-winning author and poet. Purchase her book Worthy of the Prize Sports Camps: A Church's Guide to Implementing an Effective, Community-Reaching Christian Sports Camp to be used as an outreach tool for your church or mission organization, and her ebook find joy in the journey: how 12 women could face tomorrow just because He lives for inspiring stories of women who found overwhelming joy despite their circumstances. Erin is the wife of Aaron, the Worship Pastor at FBC Greeneville, and a work-at-home-momma to 2 crazy little boys, Anderson and EJ. Click here for full bio. 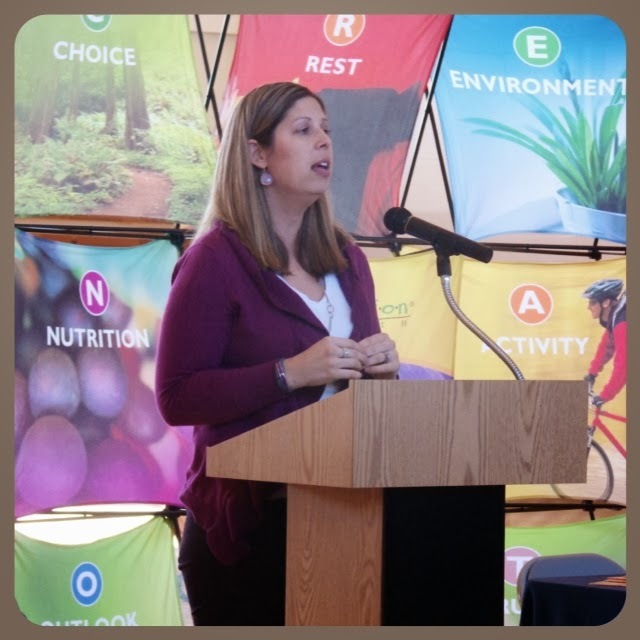 Actually, I have just been so busy implementing Creation Health in our community, I have not had the time to tell you about all that I have been up to recently. But seeing that I have 4 more events next week alone, I am going to give you a quick overview so that I can get caught up. In early December, Creation Health hosted its first official community event: Ladies Night Out @ Bee Creative, a fun art studio in our town. 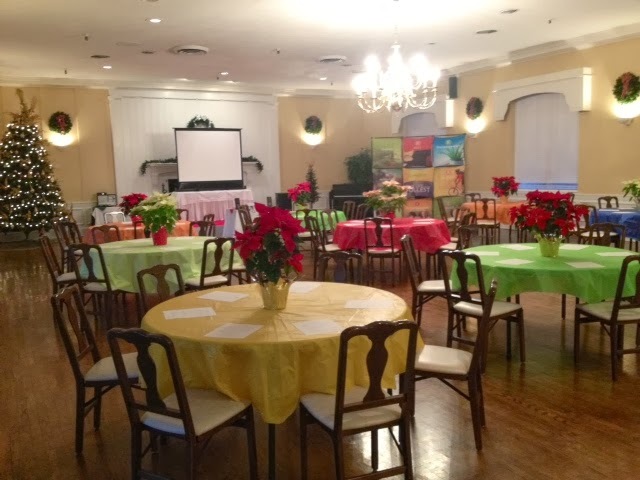 As you know, CH has been apart of a variety of community events, either as a speaker or a vendor, but this was the first one that we have hosted, besides the initial Kick-off Breakfast @ The General Morgan Inn, where we introduced the program. Ladies Night Out consisted of 45 women (a sold-out crowd) coming together to paint a fabulous Christmas door/wall hanging, while enjoying a healthy holiday treats taste test (with recipes, to be used at holiday parties) and several fun giveaways (including 2 gift cards donated by both Walgreens in town) which gave an overview of the program. 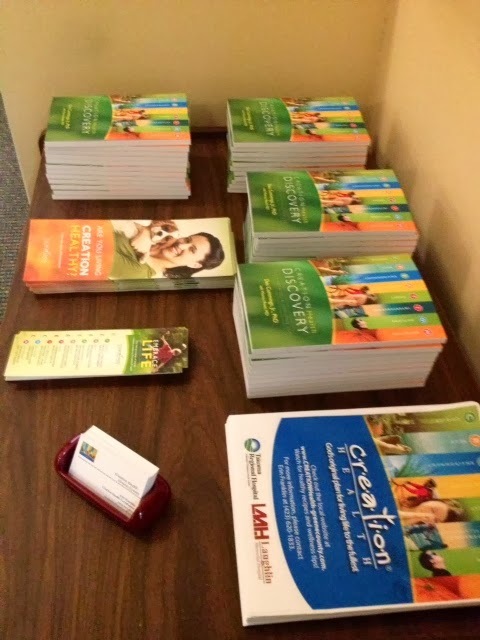 Each attendant also received a Creation Health discovery book, as well as a day pass to the Greene County YMCA. 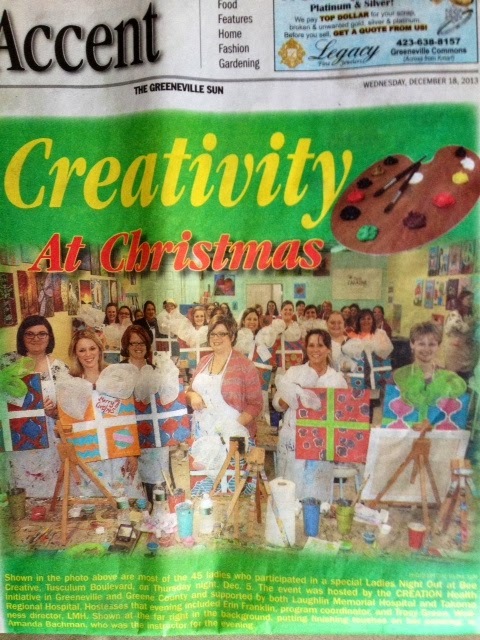 The event was featured in the Greeneville Sun, along with the following healthy recipes that were shared! Combine 12 oz light yogurt (any flavor, I used strawberry) with 8 oz fat-free cool whip. Combine 16 oz plain Greek non-fat yogurt with 1 packet Hidden Valley Ranch dip mix. Pour 8-9 c goodies together into a large bowl. (I used corn chex, rice chex, bran chex, unsalted peanuts and unsalted pretzels) Melt ½ c light margarine in a small bowl. Add 4 ½ tsp Worcestershire sauce, 1 ¼ tsp seasoned salt and stir. Pour sauce into bowl of goodies, mix well. Pour mixture into shallow baking pan. Bake for 1 hour at 250 degrees, stirring every 20 minutes. Slit the side of a date and tuck in your nut of choice. I used walnuts. Preheat oven to 350 degrees. Mix 29 oz can pure pumpkin, 12 oz can evaporated milk (can substitute fat-free), 3 eggs (can substitute ¾ egg substitute), 1 c sugar (can substitute 1 c Splenda), 1 tsp salt and 3 tsp cinnamon, until well blended. Pour batter into 9x13 greased pan. Sprinkle 1 box Pillsbury sugar-free yellow cake mix on top and cover with 1 c chopped pecans. Pour ¾ c melted margarine (can substitute light or fat-free margarine) over top. Bake 50 min. Serve hot or cold. Mix 2 ½ c skim milk and ½ c fat-free half and half with a wire whisk. Add 1 tsp vanilla extract, 3 tbsp sugar (can substitute 3 tbsp Splenda), 2 tbsp unsweetened cocoa powder and 1/8 c semi-sweet chocolate chips (can substitute dark chocolate chips). Mix well. Set crockpot to low, heat until chocolate is melted and mixture is warm, about 2 hours. Stir every 30 min. Mix together in a large bowl 1 green pepper diced, 1 red onion diced, 4 stalks celery diced, 2 13-16oz canned beans of your choice (kidney, pinto, black, garbonzo or black-eyed peas) rinsed and drained, 1 can corn of choice (shoepeg, white or yellow) drained, and 1 4oz jar pimentos, chopped and drained. Combine together in a pot and bring to boil 1/4-1/2 cup olive or canola oil, 1/4-1/2 cup sugar or Splenda to taste and 1/2 cup vinegar of your choice. Let cool and pour over ingredients in large bowl. Cover and chill for 12 hours or longer. Keep cold until ready to serve. Serve as a chip dip with whole grain or baked Tostitos, or simply as a salad topping, bean salad or relish. Preheat oven to 375 degrees. Coat a 13x9x2 baking pan with nonstick cooking spray. Combine 1 cup canned pumpkin, 1 1/4 whole wheat flour, 1 cup packed dark brown sugar, 1 teaspoon low sodium baking powder, 2 teaspoons ground cinnamon, 1/2 teaspoon ground ginger, 1 teaspoon ground nutmeg, 1/2 teaspoon salt, 1/2 teaspoon baking soda, 1/4 cup low-fat buttermilk, 1/4 cup vegetable oil, 2 teaspoons vanilla extract, 2 eggs, 1/2 cup chopped walnuts and beat well, about 400 strokes. Pour into prepared pan and bake for 30-40 minutes. Cool on a baking rack; cut into bars. Could also bake in a mini muffin pan, but you would need to adjust cooking time. 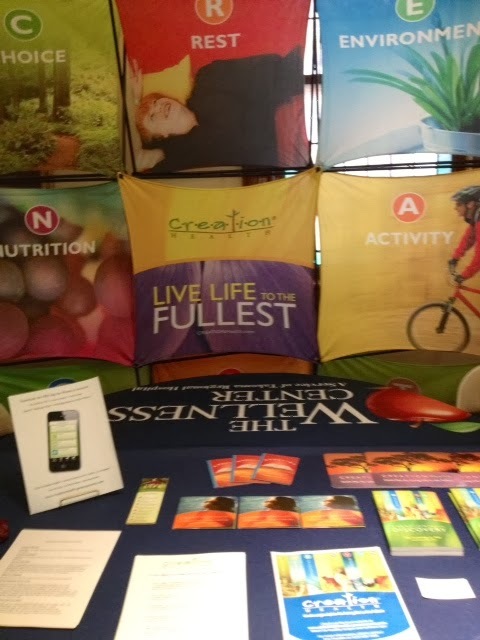 A few days later, I had the privilege of hosting a booth at the Diabetes Health Fair @ Takoma, where I passed out CH books and other promo materials. 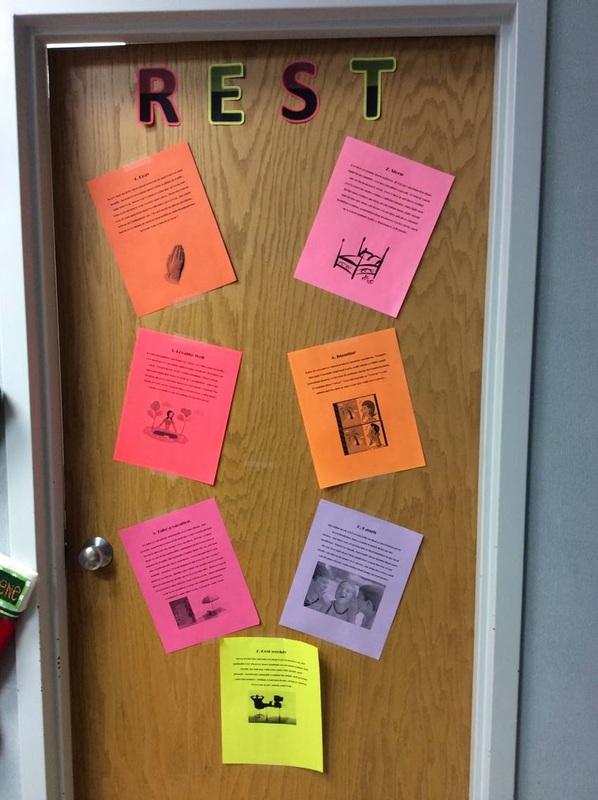 A few days after that, I held another Coaches Day at both Takoma and Laughlin, to pop in and see how the coaches had been implementing R- Rest in their departments. This time Mandy, one of the CH trainers from Florida, toured with me. The next day we held the 2nd CH Leadership Training for hospital leaders from both Takoma and Laughlin out at Link Hills Country Club, where they learned the last four principles that make up the acronym CREATION, which are T - Trust, I - Interpersonal Relationships, O - Outlook and N - Nutrition, as well as more ways to implement the program. I was excited to give an update as to what the CH coaches at each hospital had been up to since the first training, as well as some things that were happening with CH in the community. All in all, Creation Health - Greene County was apart of 40 events in 2013, after we introduced the program to our community at the end of July! So awesome! I kicked off 2014 by speaking to employees at Greene Valley and am so excited to announce that they will be our first company to go through our 8-week CH seminar! More details on that soon! At the end of January, I was blessed to speak at the Senior Adult Luncheon @ FBC. And just last week, I had the opportunity to speak to the AARP group @ Takoma. Whew! Remind me to never get behind on the blog again! ;) And by the way, I always hand out CH books and other promo materials when I speak or set-up a booth. 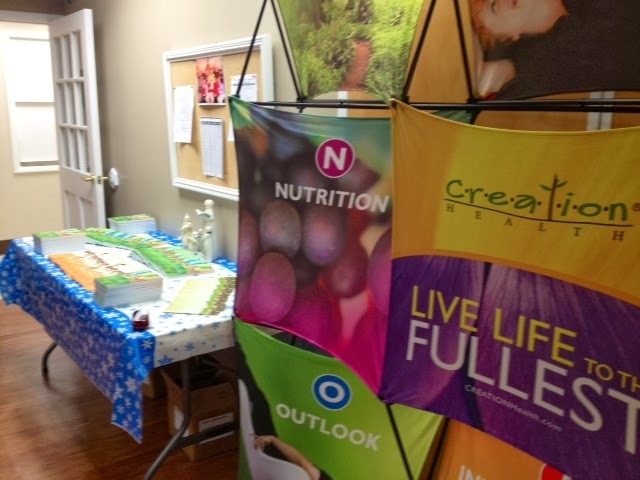 Let me know if Creation Health can be apart of your next event! Will be back soon to report on all of my upcoming opportunities!